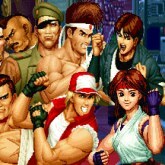 Description: Illegal drug traffickers and arms dealers decide to host a fighting tournament called The King Of Fighters. Featuring the best fighters from around the world. This is seasonally an amazing arcade classic fighting game with some very memorable characters. Terry Bogard and Joe Higashiare two of my favorite character to play as, and they were originally introduced to the Fatal Fury Series. The King Of Fighters pumped it on a notch though, and 1994 was the first game in the series and still to this day hangs with the later editions. Hope you enjoy playing KOF '94. Game Controls: Shift Key = In-cert Coin. Enter Key = Start. Arrow Keys = Move. Z, X, S, C = Attack Keys. See In-game Controls for more options.